SHANGHAI, Dec. 4, 2018 /PRNewswire/ -- CARsgen Therapeutics, a clinical-stage company committed to developing Chimeric Antigen Receptor T cell therapies for cancer, presented initial safety and efficacy results from its ongoing investigational study of CT053 for patients with relapsed/refractory multiple myeloma (R/R MM) at the 60th American Society of Hematology (ASH) Annual Meeting in San Diego. CT053 is a fully humanized CAR-BCMA-T cell therapy developed by CARsgen Therapeutics for patients with relapsed/refractory multiple myeloma (R/R MM). 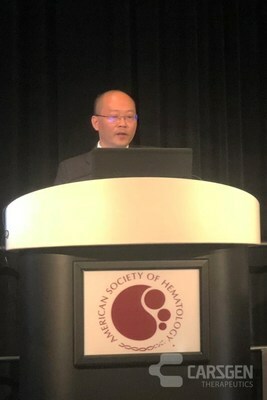 Professor Songfu Jiang, principal investigator of this study from the First Affiliated Hospital of Wenzhou Medical University, made an oral presentation entitled "Phase I Results of Human BCMA-Targeted CAR-T Cells in Patients with Relapsed/Refractory Multiple Myeloma". The multicenter study was conducted at the First Affiliated Hospital of Wenzhou Medical University, the First Affiliated Hospital of Zhejiang University and Xinhua Hospital Affiliated with Shanghai Jiaotong University School of Medicine. As of July 12th, 2018, 17 R/R MM patients were enrolled and received a single-dose infusion of 0.5~1.8 x 108 CAR-BCMA-T cells with a median follow-up period of 92 days (min;max:10-272). 14 of 17 patients were eligible for efficacy evaluation for more than 4 weeks after infusion. CAR-T cell expansion was detected in peripheral blood 1-3 days following treatment in all patients. Of the 14 subjects who received CT053, an overall response rate (ORR) of 100% was observed, 78.6% achieved very good partial response (VGPR) and complete response (CR/sCR). All the patients generally tolerated the treatment well. Five patients developed Cytokine Release Syndrome(CRS) 1~13 days after receiving single dose infusion, including 4 pts of Grade 2 and 1 pt of Grade 3. The syndrome was relieved 3-6 days after treated with Tocilizumab. "R/R MM treatment remains a highly unmet medical need. The CT053 CAR-BCMA T cell therapy demonstrated manageable safety and significant efficacy profile, considering many subjects were extremely ill when enrolled. (41.2% patients ECOG PS>/=2)", said Dr. Zonghai Li, founder and CEO of CARsgen, "I'd like to extend my sincere thanks to all the researchers, patients and their families who gave their trust to us in this study. We look forward to initiating global pivotal clinical trials for our CAR-BCMA-T cell therapy to provide effective treatment for more patients in the near future." Multiple myeloma (MM) is a type of plasma cell malignancy resulting from the clonal proliferation of malignant plasma cells (PC) within the bone marrow (BM). Although recent treatment regimens and drugs have improved efficacy and survival for R/R MM patients in recent years, effective treatment options are still very limited. BCMA CAR-T cell therapy represents a promising potential curable treatment for R/R MM. CARsgen Therapeutics is a clinical-stage immune-oncology company committed to the development and commercialization of CAR-T therapeutics for unmet medical need. The company has launched several First-in-Human CAR-T clinical trials to treat relapsed/refractory tumors, including CAR-GPC3-T for hepatocellular carcinoma and squamous lung cancer, CAR-EGFR/EGFRvIII-T for glioblastoma multiforme and CAR-Claudin18.2-T for gastric and pancreatic cancer. CARsgen also has ongoing clinical programs of humanized CAR-CD19-T for acute lymphocyte leukemia and fully humanized CAR-BCMA-T program for multiple myeloma.